AMA PRA Category 1 CreditsTM are available! Click View More below for additional information. Hear an update on the implementation and use of the state's medical cannabis program with data from the Minnesota Department of Health's Office of Medical Cannabis (OMC). 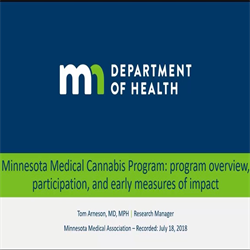 Tom Arneson, MD, MMA member and OMC Research Director will discuss emerging medical cannabis research, share patient experiences and answer questions about the program. Dr. Arneson has reported that he has no actual or potential conflicts of interest in relation to this activity. The MMA staff and other planning committee members who were involved in the development and implementation of this activity have no actual or potential conflicts of interest in relation to this activity. No commercial support was received for the development or implementation of this activity. To receive CME credit for this activity, complete and submit the online evaluation form. Upon successful completion of the evaluation, you will be emailed a certificate of completion within 2 weeks. You may contact the accredited provider with questions regarding this program at cme@mnmed.org. Participants must complete all necessary activity components by the above ‘valid through’ date to be eligible to claim CME credit. The Minnesota Medical Association designates this enduring activity for a maximum of 1.25 AMA PRA Category 1 Credit(s)™. Physicians should claim only the credit commensurate with the extent of their participation in the activity.